Sizzling Summer $1000+ Cash Giveaway! I am so excited to be joining 37 fellow bloggers to bring you a sizzling summer $1000+ cash giveaway! There will be three (3) winners in this giveaway. Two (2) people will win $500 cash and one (1) person will win $250 cash. $500 or even $250 can go a long way in making your summer awesome! If I had extra cash I’d use it to take a boating trip with my family. We’ve been wanting to take our girls (and our boat) to the Apostle Islands. What would you use the money for? Terms & Conditions: This giveaway is open world wide and runs from midnight EST May 15th to 11:59 EST on June 15th . The (3) winners must be 18 years or older to win. The winner will be chosen by random.org no later than June 20th. All mandatory entries must be completed. The entries will be verified. 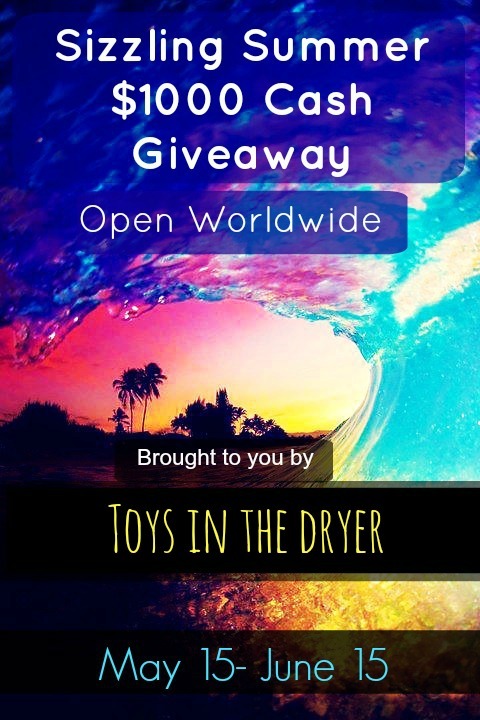 Toys In The Dryer is not responsible for choosing winner or awarding prize. Full Lives Reviews blog is ultimately responsible for this giveaway, choosing winner, and awarding prizes. Full Lives Reviews can void an entry if entrant did not add verification. The winner will be notified via email and will need to respond to that email within 24 hours to claim their prize. Once the prize is claimed a notification will be sent out to the co-hosts for announcement. Void where prohibited.